Ingrid Naiman has 50-60 including, including four others exclusively devoted to cancer. These are described and linked below. CancerSalves.com was one of Ingrid’s first sites. It began with about 13 paragraphs, each on a separate page. 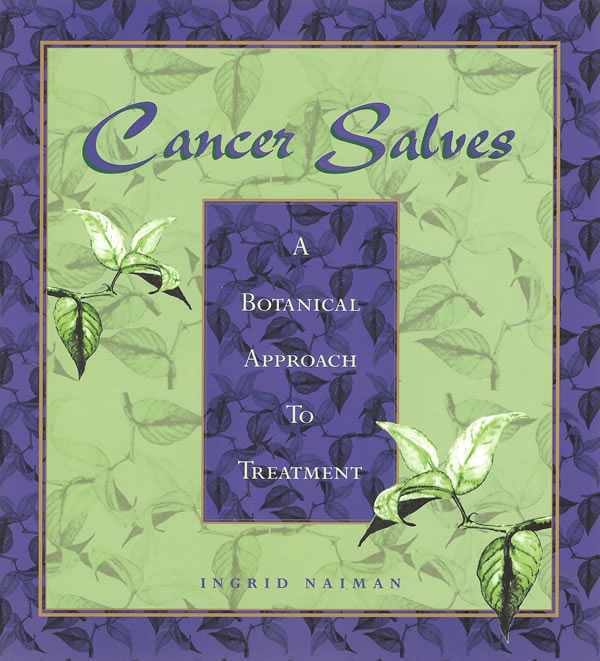 The material is not the same as in the book Cancer Salves: A Botanical Approach to Treatment. It is less formal and addresses many of the questions people have asked over the years. The forum is archived and no further posting is permitted. One section of CancerSalves.com grew and grew and was separated into CancerChecklist.com. There is a wealth of information on detoxification and regeneration as well as emotional and spiritual approaches to cancer and its prevention and treatment. Many posts to subscribers have been archived on IngridNaiman.com and organized into a special section devoted to cancer. Hundreds of other posts can be found on that sites relating to parasite cleansing, mold remediation and treatment, immunity, and much more. CaHerbs.com is strictly related to herbal products patients may want to try. The entire product line began with re-creations of formulas used historically by cancer specialists. CancerSalves.net is for practitioners and contains case histories and photographs. An application is required. Practitioners can also apply for wholesale accounts at SacredMedicineSanctuary.net.